When the Archdiocese of Philadelphia launched its major fundraising campaign Heritage of Faith-Vision of Hope in 2008, its stated goal was $200 million. Six years and more than 50,000 pledges and gifts later, the capital and endowment campaign reported raising a total of $222.2 million. But that does not mean the archdiocese is now flush with hundreds of millions in cash and the fiscal austerity under which it has been operating for the past several years is now abated. A clear picture of how successful the campaign was as of June 30, 2014 emerges in audited financial statements prepared by the firm Grant Thornton and released along with an explanatory document by the Philadelphia Archdiocese Feb. 13. The $222.2 million includes $36.5 million of pledges made to purely parish-based capital campaigns unconnected to Heritage of Faith. Such “combined campaigns” were subtracted from the total reported for the campaign in the audited financial statements. 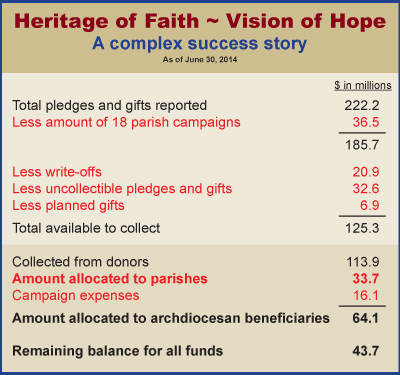 So instead of $222.2 million, $185.7 million was pledged to Heritage of Faith-Vision of Hope’s campaign to fund parish and archdiocesan priorities indicated in the campaign’s original case statement including six capital projects, five endowment funds and three other funds for future needs. As the campaign ramped up to solicit donations in early 2009, one of the worst economic recessions in U.S. history intensified. Succeeding years saw events that delivered a body blow to the confidence of Catholics: the second Philadelphia grand jury report of clergy sexual abuse; the conviction of the former archdiocesan chief financial officer on embezzlement charges; mass layoffs of archdiocesan staff; closures and mergers of parishes and Catholic schools; and the revelation of severe financial distress of the archdiocese leading to the sale of archdiocesan properties. Given that climate it might come as little surprise to learn almost $21 million was written off from the campaign because donors explicitly refused to fulfill their pledges. Another $32.6 million was determined not to be collectible based on an analysis of collection trends. From the $185.7 million pledged, $125.3 million is available to collect from the campaign’s pledges and gifts. The sum of $113.9 million was already collected and another $11.4 million is reasonably expected to be collected in the future. As the pledges are collected from the donors, the cash is allocated to parish campaigns and the archdiocesan priorities. More than $33 million — less than half of the projected $70 million goal — was allocated for parishes through the campaign. After accounting for $33.7 million for parishes and $16.1 million in expenses of which $8.8 million was paid to Community Counseling Service — the New York-based firm that conducted the campaign in the archdiocese — $64.1 million, or 49 percent of a projected goal of $130 million, was allocated to archdiocesan beneficiaries. See the full list and breakdown of allocations. In most cases about half the money projected for a particular need was allocated from the campaign. For example, an endowment fund for Philadelphia seminarians at St. Charles Borromeo Seminary had a goal of $5 million. A fund for the purpose was established and received allocations of $2.5 million. After distributions and investment earnings , the endowment had a balance of $2.8 million as of June 30, 2014. At that time cash and investments of $52.6 million were available to meet the $43.7 million remaining for the archdiocesan goals, $8.8 million due to parishes and about $100,000 of accrued expenses. A further $11.4 million remains to be collected for the campaign and, according to a document supplied by the Philadelphia Archdiocese that accompanied the Grant Thornton statements, the funds will be allocated to the stated archdiocesan priorities. The archdiocese also released audited financial statements by Grant Thornton for the annual Catholic Charities Appeal on Feb. 13, covering the fiscal year ended June 30, 2014. In that period the appeal, which funds numerous archdiocesan Catholic social ministries, raised more than $9.5 million in contributions plus other income for a total of $9.6 million in revenue. Catholic Charities has exceeded its fundraising of goal of $10 million for the appeal in each of the last several years. The difference is attributable to the fact that the appeal runs on a calendar year and the statements report on the end of the fiscal year at June 30. Nevertheless expenditures topped $10 million, of which more than $8.5 million went toward subsidies for Catholic agencies. The difference of $446,693 was made up from drawing down the appeal’s net assets to $1.3 million from $1.8 million at the beginning of the fiscal year. In the previous fiscal year a similar occurrence resulted in a net loss of $320,251 and a draw-down from previous year net assets of $2.1 million. The 2015 Catholic Charities Appeal, on which the audited financial statements released Feb. 13 do not report, is currently underway in the archdiocese.